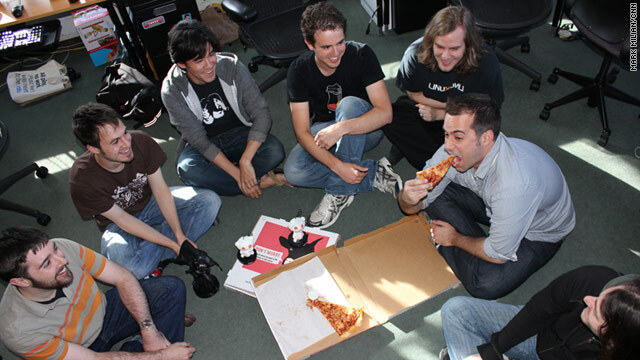 Reddit developers, including general manager Erik Martin with pizza in hand, sit in their San Francisco office. San Francisco (CNN) -- Arranging to have pizzas delivered to a stranger's door is a classic prank. On the Web, it's charity. Ashley Qualls found that out recently when she posted an offer on the link-sharing website called Reddit. The Santa Clarita, California, native was feeling especially charitable one day and asked the site's audience of 18.8 million visitors how she could donate to people in need. "Someone had commented saying, 'Hey, you should take this over to Random Acts of Pizza,' " Qualls said. Surfing to that section, she found people posting their pleas for free pizza. Members are encouraged to place orders for requests they feel especially moved by. One person said on Thursday that he went out of town and left his wallet at home, and another said he lost his credit card and is sick of eating tortillas. But the true spirit of Random Acts of Pizza, the creators and some members say, involves donating to people who couldn't otherwise feed themselves -- and yet are Web savvy enough to panhandle online. "It's about helping someone out while they're down at the moment," Qualls said. She has sent 10 pizzas so far that were delivered to hungry strangers. Qualls has been active in other charity work, including online-donation programs, but Random Acts of Pizza provides "instant gratification," she said. Pizza recipients generally give thanks and sometimes snap a picture of the empty pizza box after the order is placed, in 30 minutes or less. The section's popularity has tipped. It received 226,000 visitors in a recent week. Other charitable efforts on Reddit have taken off. SnackExchange, Food Pantry and Closet Swap all encourage giving to the poor. Still, the 10-person team that develops Reddit, which itself has grown significantly in the last few months, were surprised to see the program take off. Earlier this month, they pooled their cash and spent $120 on pizzas for the Homeless Youth Alliance in San Francisco. "We never would have said, 'Oh, Reddit would be a great platform to give pizza to strangers,' " said Erik Martin, Reddit's new general manager. Donors receive the person's home address through a private message and can quickly place an order using the many websites designed for food delivery. "A big factor is just how easy it is," said Daniel Rogers, a lawyer from Texas who started the section. Rogers, along with John Mitchell, a former computer technician in Idaho, are attempting to get Random Acts of Pizza on the radar of a major national pizza chain. Domino's Pizza and Little Caesars Pizza have expressed vague interest, Mitchell said. Separately, Reddit, which is owned by publisher Conde Nast, has reached out to the big restaurants. "We've heard of the program, but have had no direct contact with Reddit," Domino's spokesman Tim McIntyre wrote in an e-mail. Random Acts of Pizza sent a request to CashStar, which powers the system that many retailers use for ordering gift cards and which many Random Acts of Pizza donors use to gift meals, asking the site to accept credit cards from outside the United States, Mitchell said. But the process is slow-moving. CashStar CEO David Stone said through a spokeswoman that he had never heard of the group. The co-creators of the pizza-giving program have wives and children, and they each lost their jobs during the worst of the economic downturns. Since connecting online (they've never met) and improving their fiscal situations, Rogers and Mitchell decided to organize a charitable group online. But why cheese, sauce and dough? "It was the one food during that time period (of hardships) that I didn't have a lot of, that I love," Rogers said. "It wasn't just about pizza. It's about just getting that kind of comfort food and that kind of hope."